Limited time and quantity only; first come first serve. The Classic Army M4 10" ARSS4 Keymod carbine in the dark bronze finish is one of the newest rifles from Classic Army. The ARSS4 features a 10 inch keymod rail with keymod slots at the 3, 6, and 9 o'clock position, which provides plenty of space for mounting keymod accessories or keymod picatinny rails. Internally this gun features Classic Army's 9mm full metal gearbox with high torque steel gears, high torque motor, reinforced piston and a 6.03 tightbore barrel. These rifles also include a mosfet to protect your trigger contacts from shorting out. The Dark Bronze finish gives this rifle a very unique look and will stand apart from most rifles on the field. Step up to the plate with the Classic Army ARSS4 10" Keymod Carbine. This rifle makes an excellent CQB rifle and allows you to easily move in and out of buildings swiftly. Getting yourself out on the field and being competitive does not have to be expensive. Whereas in the past it could cost you upwards of $300 to have your airsoft gun, tactical gear, eye protection, magazines and bb's, Lancer Tactical now makes it entirely possible to be out and playing for less than $200! Don't be mistaken, just because many of these airsoft guns have a sub-$120 price tag does not mean that they are the same as the low power electric or spring powered guns that you might find elsewhere for similar or lower prices. 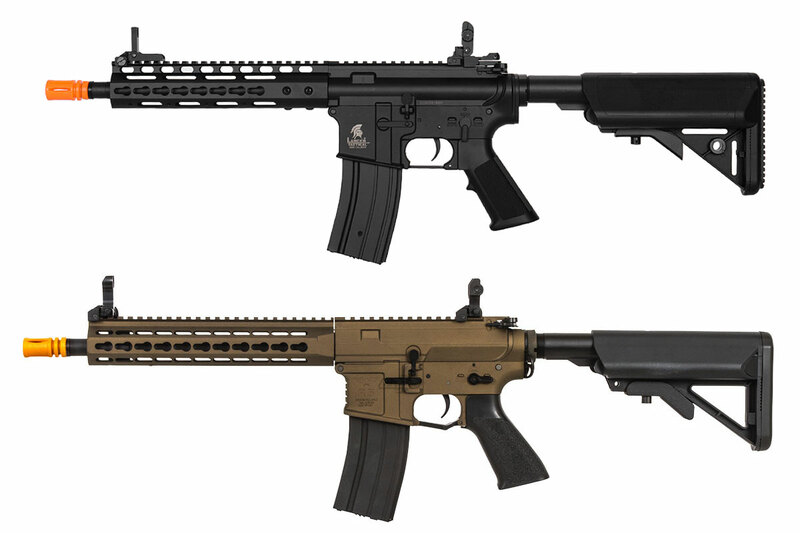 The Lancer Tactical models are skirmish-grade airsoft guns, unlike the LPEG's and spring guns found elsewhere that are just toys. Don't let the low price of the Lancer Tactical M4 Airsoft Gun fool you into thinking it is a low quality option, or that it is going to break on you immediately. This is a skirmish-grade, battle-ready airsoft gun that is ready to help you take down your enemies on the field. The gun's internals are all standard Version 2 parts which means it is fully upgradable, and should you decide to, you can build it up into an even more impressive addition to your arsenal.